Does your FREE Shipping offer also apply to custom printed orders? How long does it take to process and ship custom printed orders? Are there any one-time set-up charges? How much is the cost to print each garment? Can you print our logo? Where can our logo be printed on the garment? Can I place orders for custom printed garments online? 1) Does your FREE Shipping offer also apply to custom printed orders? Yes. As long as the merchandise total of your order is $ 300 or more, we will ship your order via UPS Ground free of charge. We reserve the right to charge shipping charges on Net 30 orders. 2) How long does it take to process and ship custom printed orders? 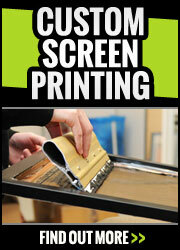 Custom printed orders typically ship in 3-7 working days. Because we print in-house, we can offer 2 Day Turn-Around on most items (the order would ship 2 working days after payment is made). An additional rush charge will apply. Call for details. 3) Are there any one-time set-up charges? Yes. 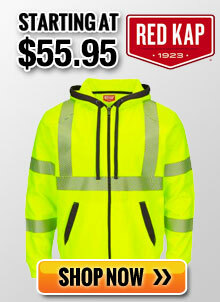 There is a $ 30 one-time charge per color. Art charges may apply if vector (print-ready) artwork is not provided. There are no set-up or art charges on exact re-orders. 4) How much is the cost to print each garment? 5) Is there a minimum order? Yes. The minimum order for custom printed orders is typically 36 pieces for a one color design. There are sometimes exceptions made on higher priced items. 6) Can you print our logo? Yes. If you don’t have camera-ready artwork, we can take your logo and prepare it for printing. Additional art charges may apply if the logo is very complex. 7) Where can our logo be printed on the garment? Your logo can be printed on the front, sleeve or full back of the garment. Most custom printed orders are printed on the left chest or the full back. 8) Can I place orders for custom printed garments online? No. Custom printed orders must be called in or emailed. 9) Who can I contact if I have more questions? Does your FREE Shipping offer also apply to custom embroidered orders? How long does it take to process and ship custom embroidered orders ? How much is the cost to embroider each garment? Can you embroider our logo ? 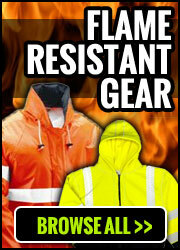 Where can our logo be embroidered on the garment ? Can I place orders for custom embroidered garments online? 1) Does your FREE Shipping offer also apply to custom embroidered orders? Yes. As long as the merchandise total of your order is $ 300 or more, we will ship your order via UPS Ground free of charge. 2) How long does it take to process and ship custom embroidered orders? 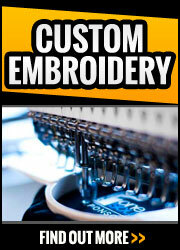 Custom embroidered orders usually ship in 10 working days. Yes and no. If we are embroidering your logo, there is a one-time set-up charge that varies depending on the complexity of the logo. Most logos are set-up for between $ 75 - $95. If we are just embroidering your company name is basic block or script lettering, then there would not be any set-up charges. There are no set-up charges on exact re-orders. 4) How much is the cost to embroider each garment? No. We try to stick to a minimum order of 12 pieces, however we can embroider smaller quantities upon request. 6) Can you embroider our logo? Yes. If you don’t have camera-ready artwork, we can take your logo and prepare it for embroidery. Additional art charges may apply if the logo is very complex. 7) Where can our logo be embroidered on the garment? Most logos are embroidered on the left chest of the garment. Baseball caps can be embroidered both on the front and back of the cap. 8) Can I place orders for custom embroidered garments online? No. 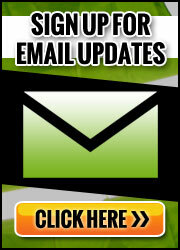 Custom printed orders must be called in, faxed or e-mailed.